A lone farmer works tirelessly to plant his crop in this painting. This is one of Van Gogh’s examples of impressionism and Japanese inspiration, blending landscapes with portraiture. Van Gogh is one of Holland’s most distinguished artists. Given this, we are committed to recreating his works with utmost accuracy and passion. 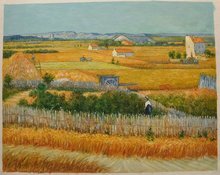 All of our paintings are hand-painted, by our artists who have thoroughly studied all of Van Gogh’s techniques such as colour mixing, impasto, brush strokes, rhythm of application, and brush strokes. 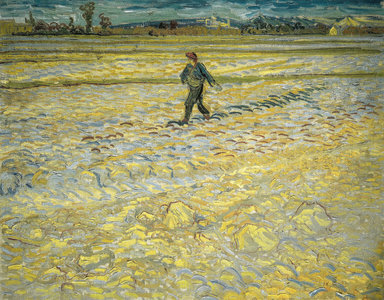 Before Van Gogh started painting wheat fields and farmers, he was initially turned down by the ministry. 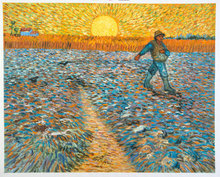 On a search for spirituality, he found that working with farmers, to capture their toil on canvas, was soothing for him. The challenge lay with having to work quickly. Since the farmers could not be stopped from doing their jobs, he focused on capturing as much of the image as possible in his memory. Later on, when he had the time, he tried to paint from memory. This worked out well, and also increased the skill and pace at which he painted. To Van Gogh, the essence of nature was something of the divine, and he felt that it was his responsibility to faithfully capture that on canvas. After a period of withdrawal from society, he found that spirituality and a connection with nature was something that he found in painting. His spirituality rose from the fact that being closer to God did not necessarily mean service to the ministry. 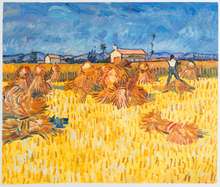 Van Gogh used many techniques to create his work. Since his move to Arles, he learned a lot of styles, including impressionism and Japanese portraiture. He implemented everything that he learned in those methods in his paintings.